Today is the first challenge over at Crafting When We Can. The challenge is "Do It Your Own Way|"....so anyone can join in. Will you? We are sponsored by Heather at Fresh Brewed Designs. Be sure to pop over and check out all the digi's. Heather has lots of fab designs. A simple card to focus on the image. I used only one copic marker for this image. I really wanted to draw attention to the hearts. I added some stickles for bling around the scalloped edges. The paper is from my black and white stash. This is so pretty and elegant, Janet! Like the card & image. 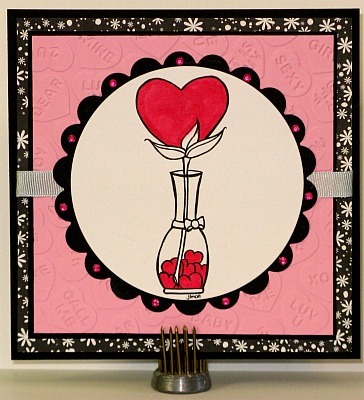 I recognize the embossing folder with hearts used. I entered the Play Date Cafe challenge PDCC97 also. Super pretty! Great embossing;) Thanks so much for joining in the fun and playing along with us over at the PDCC! This is BEAUTIFUL!!! I love how you colored it. IT does draw attn to the hearts and is so beautiful!! I am very happy to have been able to sponsor your very first challenge! This is beautiful! Thank You for joining us this week at Sweet Stampin! Too cute, thanks for playing along with CMM!